One of Milltown’s most impressive antiquities is a ruined tower house, popularly known as Kilclooney Castle, which was once the seat of a bardic school. It lies roughly halfway between Tuam and Claremorris just off the N17. Built in a quiet, peaceful area off the main through-fare the site was perfectly placed for tranquillity and relaxation. It was, in other words, ideal for the writing of poetry and it was here that the truly remarkable Ó hUigínn family of bards from Sligo based one of their places of education. It specialised in poetry and the other skills and arts that were taught in such seats of learning. 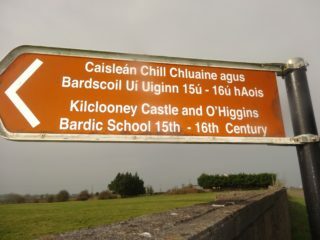 The Ó hUigínns originated in Leyney, Co. Sligo and were one of Ireland’s leading bardic families with schools in a number of areas apart from Kilclooney which was established either in the 15th century or earlier. 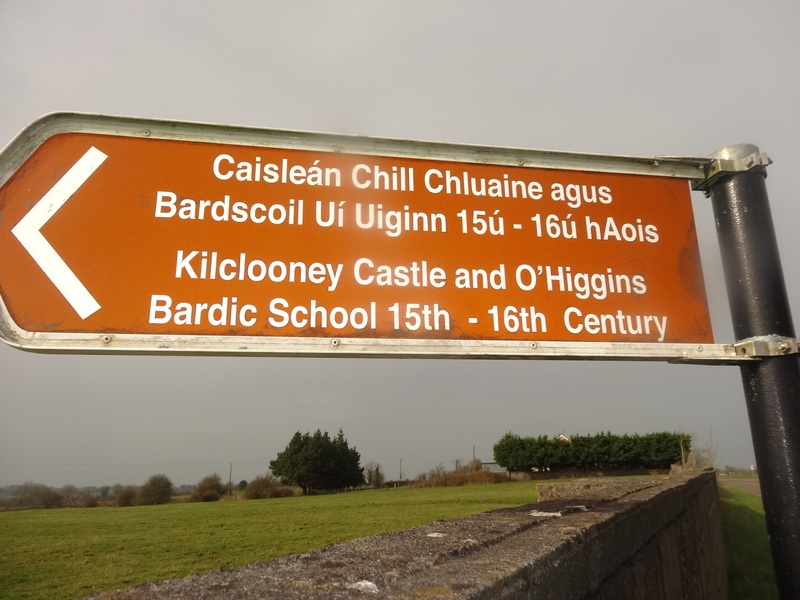 Written records are few but one source claims that the school was founded during the reign of Briain Mac Domhnaill Ó Conchubhair who ruled from 1403 to 1440. It may have been under the patronage of the local O’Connor chiefs who also had their roots in Sligo. One bardic poem of Tadhg Dall Ó hUiginn (1550-1591) who probably got much of his education in Kilclooney, states that pupils came there from Ulster and also possibly from Scotland. The profession of bard was actually an inherited role that was the preserve of certain families. For several generations that tradition continued successfully while the schools themselves probably developed from the Monastic Schools founded with the onset of Christianity but may even have flourished in some form in Druidic times. Curiously the gift was often passed on despite young poets sometimes being fostered to other families and there is also a claim that the Ó hUiginns reciprocated by accepting the occasional child from other distinguished households. Although Kilclooney has usually been translated locally as Cill Cluanaigh which presumably means church of the meadow (and there was a church there at one stage), it has been described in academic circles as Ceall Cluaine which would suggest a site with cells. Indeed traces of stone structures near the ruins of the old church nearer to the main road could well be the remains of cells. This could describe the accommodation of the students who would have been provided with individual rooms where they could concentrate on their studies. Most sources are agreed that the Academic year lasted from November until the following March. Apart from a probable break at Christmas the term involved meant that students had only very limited free time, probably from Saturday until Sunday night to visit their own homes if within reach or spend time with the local gentry who would curry favour with them as the trained poets had the power to praise or denigrate individuals at any level of society. A poem quoted in the “Book of O’Conor Don” (c.1631) corroborates this when it makes a fleeting reference to Tadhg Dall and his violent death. The Dictionary also states that his father and grandfather “were also poets who practised the family profession in a direct line of descent from Tadhg Óg Ó hUiginn who died in 1448. Tadhg Óg whose mother’s name was Áine, was a son of a father of the same Christian name who died in 1391. He had an older brother Fearghal Ruadh who died young and whose death he mentions in his poetry. Tadhg Óg was said to be a great-grandson of yet another Tadhg Ó hUiginn, a celebrated poet who died in 1315. He died in 1448 at Cill Chonnla (Kilconly) in the barony of Dunmore, Co. Galway and was buried in the priory of Áth Leathan (Straide) in Co. Mayo. Maol Muire (Miler or Myler O’Higgins) was a brother of Tadhg Dall. He was not only a poet but also a Franciscan who was consecrated Archbishop of Tuam in 1586 and who may have died in Antwerp on his way back from Rome in 1590. Eleanor Knott the distinguished writer who was an expert in the poems of Tadhg Dall claimed that he may also have had another brother, Tomultach Óg. Tadhg Dall had at least one son, Tadhg Óg, who was born in 1582 and who was described in 1603 as a “rhymer.” By the 1630s he had become one of the biggest native landowners in the county and was appointed Sheriff of Sligo in 1634 and was selected as a delegate to the confederate assembly in Kilkenny in the 1640s. There would be lessons to be learned at the time in Tadhg Dall’s and other schools from examples that would stand the students in good stead in later life. An ollamh – the equivalent of today’s modern professor or school principal- would be the master of the school and would have been a strict disciplinarian. As far as can be ascertained, each student in Kilclooney would have to master Latin as well as the native Gaeilge. It was said that the students of those schools were far more than just poets or fili in Irish. They were all-round scholars that won fame and respect both at home and abroad. It is claimed that their apprenticeship took no less than twelve years (although some suggest six or seven) and it demanded considerable sacrifice from those involved. Either way when the difficult course was finally completed it was a bittersweet occasion for the scholars. The years of dedicated toil were over but Tadhg Óg Ó hUiginn suggested that in his brother’s school the students were sorry to hear the cuckoo’s first song, for the break-up of the session was then near. O ye who were in this house and sought art and residence, well might it be hateful to you to hear the utterance of the cuckoo. So apparently the Kilclooney pupils had to not only write but also remember what they wrote and be able to recite it all verbatim. There were some curious ideas about student life including the rather bizarre suggestion that they would lay on their backs in their cells with stones on their chests to assist concentration. It is hard to comprehend the thinking behind that particular rule if indeed it was true. As for the local tower house itself there is now little more than a ruin left of the original building although the ground floor with its vaulted roof and some of the second storey remain. Although it has deteriorated in recent decades, the stonework has stood the test of time so far while the remains of a bawn or enclosed lawn that could be lightly defended (although more to prevent stealing than to withstand a serious attack) is also present beside it. What little remains of the bawn in Kilclooney may have the foundations of other buildings on it which could be proved by archaeological investigation. Indeed preliminary work on the site has already taken place using professional expertise. It is estimated that at one stage in medieval times there were between 3,000 and 7,000 tower houses in the country. The tall rectangular or square masonry structures, built by both the Anglo-Normans and affluent Gaelic families were built as defended residences. Usually three or four but occasionally more storeys high they were in effect like small castles with towers that gave them their name. Good extant examples are at Aughanure, Co. Galway, Blarney, Co. Cork, Bunratty, Co. Clare and Gleninagh in the same county. The floors were connected by narrow, winding stairs going in a clockwise direction to give right-handed swordsmen an advantage in conflict. It’s said that the ground floor was used mainly for entering and leaving through a stout oak door and for the storing of goods. It usually had a vaulted roof as indeed the one in Kilclooney has. The hall would be on the second floor and the main rooms for living and entertaining were higher up but would be sparsely furnished. Like castles they would have battlements, slit windows and turrets for defence in the event of an attack. They were, in effect, fortified houses that were usually built on big farms of high quality land. That was certainly the case in Milltown. Eventually most bardic schools were adversely affected by the demise of “big houses” in changing times and declining fortunes for their owners. The reign of terror which reached its peak with the campaign of Oliver Cromwell and an ensuing prohibition on education and learning quickly took its toll and hastened their demise. “a well renowned bardic school” its days were numbered and it eventually became a relic of a glorious past. Sadly the ruined tower house in the Kilclooney meadow is now a forlorn shell of what was once an impressive home and prominent landmark that was a great centre of learning and a focal point of the region. It certainly flourished during the 15th and 16th centuries and perhaps longer. Thankfully plans are afoot locally in Milltown to do some much-needed restoration work on the building that would give it a new lease of life and enable it to stand as a permanent reminder of past glory. This page was added on 25/02/2019.